Place the avocados, cilantro, sour cream, Serrano chile and salt into a blender or food processor and mix until smooth. Place the tortilla chips on a microwave-safe platter. Sprinkle cheese over the chips and top with roast chicken pieces or shredded chicken. Microwave for 1 minute, just enough to melt the cheese. Remove from microwave. Top with sliced tomatoes and avocado crema. You can add sliced Serrano chiles to the dish if you want it spicier. You can also use the avocado crema as a dipping sauce for the nachos or chips. My favorite part of the football season is the delicious finger foods and snacks we get to enjoy. When I'm hosting game day, I like to make things that are tasty and easy to prepare because I know most of it will be gone before the first quarter ends. And I love nachos! They're the ultimate party food. 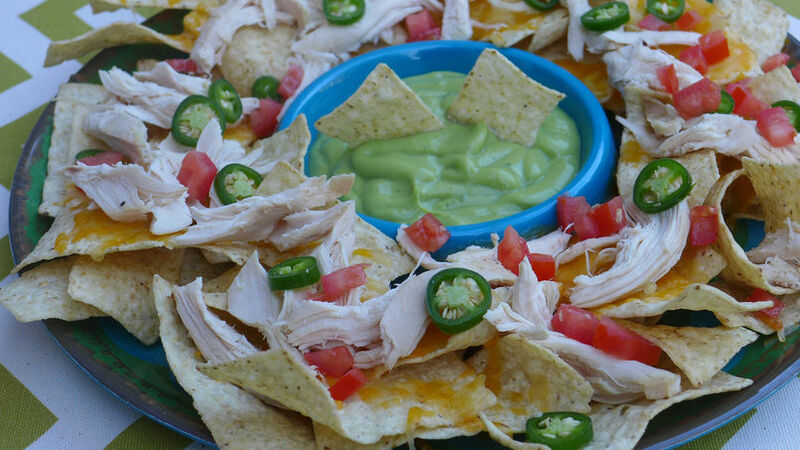 If you're looking for a super-easy treat for your football party, try these roast chicken nachos with spicy avocado crema.